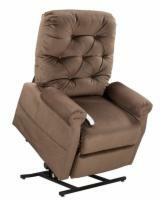 The AmeriGlide 325M is a three position lift recliner built to deliver advanced quality at a low price. The 325M has a full chaise pad for advanced support and superior comfort and a heavy duty steel lift mechanism rated for 325-pound weight loads. A one-year in-home parts and service warranty is also included in the price! Best Feature: This is an excellent all-purpose lift chair, but a full chaise pad on a chair priced this low is definitely a huge plus. Our Recommendation: The advanced weight capacity and versatile fabric options make the 325M an excellent choice for any home user of average size who needs a lift chair that can be customized to match their other furnishings.